I've heard of 3D printing, but what exactly is it? This process has been around since the 1980's, but with the cost of 3D printers and materials coming down and the ease of use going up, more people than ever are using 3D printers to have fun, get creative and even change lives. What does 3D printing have to do with the Library? Libraries have always been the great equalizer for information and computer access, and having a 3D printer publicly and freely available opens the technology to all ages and skill sets. 3D printing also supports the immediate and growing need for people to develop knowledge and skills in STREAM activities (Science, Technology, Reading, Engineering, Arts and Math), allowing community members to create, design and innovate in new and inspiring ways. What printers and materials do you use? 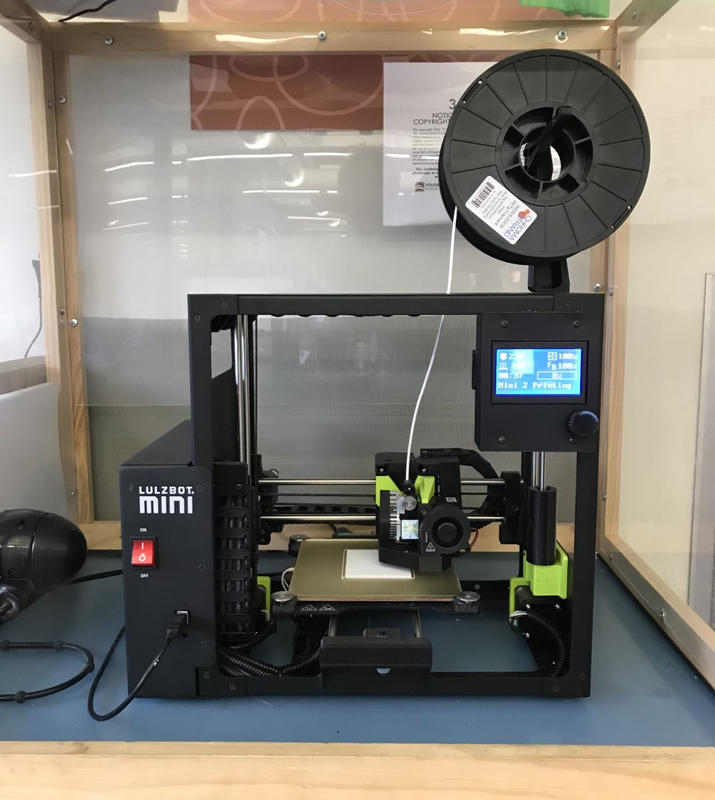 The Library currently has one "LulzBot Mini" 3D Printer, located on the 2nd floor of the Old Town Library. LulzBot Printers are made locally in Loveland, Colorado. The Printer prints objects up to 5.4"x5.4"x6" in a variety of single colors. Objects created on the 3D printer are NOT food safe. The Library uses plant-based, recyclable PLA plastic (#7). PLA does not contain BPA and is NOT heat resistant. Can anyone use the 3D printer? The entire Poudre River Public Library Community is welcome to use this printing service. You do not need a library card to print or to watch items being printed on the printer. However, only trained library staff will handle the 3D printer and associated equipment. Printing cost is $0.10 per gram of filament. Total cost is based on the estimate given by the printing software program. Printing fees are collected at the Circulation Desk at time of pickup. Most 3D print items cost $5 or less. When will I get my 3D printed item? Printing times vary based on size, complexity, and any backlog.